The Air and Radiation Protection Division operates a complex network of air monitoring stations located throughout Jefferson County to determine the quality of ambient air in the county. The data from these monitors are used to determine compliance with the Environmental Protection Agency’s National Ambient Air Quality Standards (NAAQS) for the criteria pollutants. 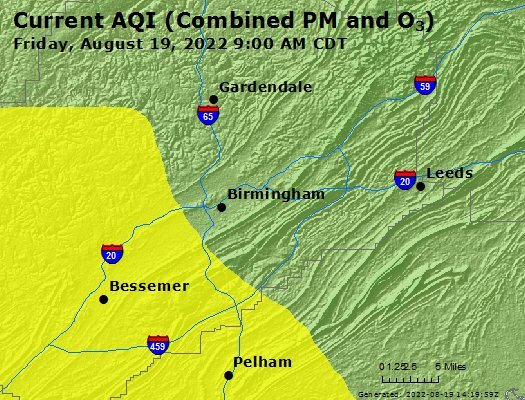 Near real-time air quality data from across the Birmingham area can be found here. Criteria air pollutant data is updated hourly and is displayed in a graphical manner. Map courtesy of EPA’s AirNow website. This table shows the status of the Birmingham area with the National Ambient Air Quality Standards (NAAQS). Annual Air Quality, Monthly Air Quality, Air Toxic Assessment, Monitoring Network Plans are available here.